While teaching at two music stores one summer about 15 years ago, I had 6 different very young students take lessons. How am I going to teach a five year old how to play the drum set and how can I teach the parent at the same time? I discovered that if I simply tell them what to play by the way it sounds, they have immediate response and can quickly achieve what they are hearing and saying. This started as a way to teach young students and their parents. 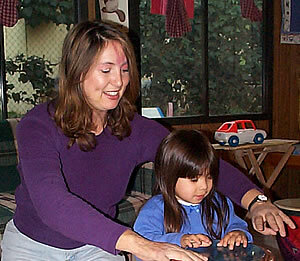 Now teaching with Drumphonics has opened up the world of teaching and learning phonetically as the way to teach many diverse people: people who really want to play now and take time to learn how to read and write drum notation, people with physical, mental and emotional challenges, elderly people who may be intimidated by reading music, families, groups, self-taught drummers who want to teach and teachers to learn and teach themselves and their class. Learning and teaching rhythm and drum set phonetically creates a more physical and less intellectual experience. I realized that teenagers can easily learn and read drum patterns but not having the patterns to read they were not remembering the patterns. I have developed exercises to say and play components of rhythm, time and fill, and to freely move between them to give confidence in their ability to remember what they have learned. Hearing the drums in music becomes easy, as soon as students hear the CHOOM CHAT they are able to play TIME with their favorite songs. I also really enjoy when I have my students perform, using Drumphonics we are able to communicate on stage and reading is not required. Learning and teaching drum set and rhythm is so much fun.